The man due to take over as Royal Mail chief executive was handed nearly £6million to buy him out of his current contract with a subsidiary, it emerged last night. 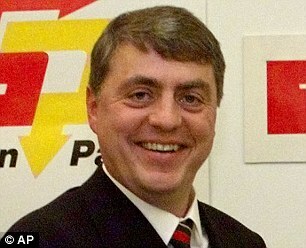 Rico Back, who is the boss of GLS, the Royal Mail’s European arm, was paid to compensate him for payments he would have otherwise received. He was revealed as the successor to Moya Greene last month but the company did not mention the payment, made last July. It will be disclosed in the annual report. The decision risks provoking union chiefs, with whom the firm has been haggling with over pay and pensions for the past year. Greene, 63, secured an agreement with unions to avoid an industrial dispute, and is set to step down at the end of this month and will retire in September. Back is also set to be paid a £640,000 salary – £100,000 more than Greene – when he takes over. Last night a Royal Mail spokesman insisted the decision to buy out Back’s contract was not related to his subsequent promotion. She said his original contract dated back to when the Post Office, then part of Royal Mail, acquired German Parcel. That gave Back various rights, such as a veto on nominees for GLS’s board, and he was also required to only give three months’ notice of resignation.